Pathways RTC produces publications on young adult mental health. Upcoming Webinar: "Drop-in Centers as a Low-Barrier Engagement Strategy"
In this presentation, which was not aired previously, Janet Walker and Caitlin Baird outline the state of the science on training best practices. It incorporates video (with special celebrity guest appearances) to help illustrate some key training principles. Pathways Transition Training Partnership presents the newest five of the ten 5-7 minute video briefs that provide overviews of key concepts and skills for service providers working with youth and young adults with mental health needs. Each video brief is accompanied by discussion questions and resources for further learning. 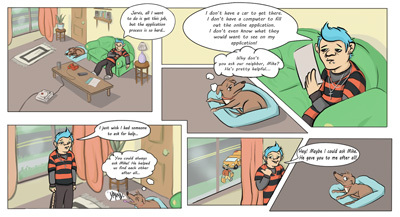 Check out our new Pathways comic, created by and for young adults and the people that care about them. A new report prepared by staff from the National Wraparound Initiative, the National Wraparound Implementation Center and the Pathways Research and Training Center looks at the ways that providers are adapting Wraparound when working with older youth and young adults. The report includes quotes from qualitative interviews with Wraparound providers. Pathways researchers have collaborated with authors from Youth MOVE National on a peer-reviewed journal article recently published in Children and Youth Services Review. The article describes the development and validation of the Youth/Young Adult Voice at the Agency Level (Y-VAL), an assessment of the extent to which agencies have implemented best practices for supporting meaningful participation. The Y-VAL is intended for research purposes, as well as to provide agencies with direct guidance about strengths and challenges regarding their efforts to promote youth/young adult voice. Pathways RTC's 2019 issue of Focal Point coming out in late April will focus on the evaluation of innovative transition programs across the country. For this webinar, we're going to focus on two examples of programs featured in the issue that are innovative in their low-barrier approach. Join us for this webinar to hear more details about how these two state programs have implemented drop-in centers as part of their success. This article, published in the journal Children and Youth Services Review, describes a social innovation that aims to provide high-quality training and coaching that is affordable and sustainable in community mental health settings. This approach is designed to train providers to work with young people in ways that increase their engagement and retention in services, as well as their alliance with treatment providers. Webinar Recording: "Trauma-Informed Care in Youth-/Young Adult-Serving Organizations"
In this Pathways webinar, which took place January 22, 2019, Mandy Davis, Director of Trauma Informed Oregon, discussed how youth- and young adult-serving organizations can implement the principles of trauma-informed care (TIC) into their organization and services. Examples and tools were provided with an emphasis on those developed by and with youth and young adults. In addition, ideas for TIC staff self-care were shared. Written by Pathways researchers and published online first in Journal of Emotional and Behavioral Disorders, the article "Is Online Training an Effective Workforce Development Strategy for Transition Service Providers? Results of a Comparative Study" describes outcomes of a longitudinal quasi-experimental study comparing cohorts of service providers receiving either online training only, or online training in conjunction with team-based practice activities. This series of free, short videos has been developed by the Pathways Transition Training Partnership to provide brief overviews of key approaches for working with youth and young adults with mental health needs. Each video brief is about 5 minutes long and is accompanied by discussion questions to assist viewers to apply the video content in their workplace, and a resource list for further learning. The video briefs accompany Promoting Positive Pathways to Adulthood, a free 10-module online training series and may be a useful enhancement to the skills covered for service providers. Visitors will be asked to enter their email address when accessing videos so Pathways can follow up for feedback.